If you are behind the proxy environment, then you must configure your proxy settings in Jenkins to download and install any plugins. In this post, I will show you how to configure proxy server setting in Jenkins CI/CD tool. 1. Login into Jenkins portal with valid credentials. 2. Go to "Manage Jenkins" available at the left side panel. 3. Select "Manage Plugins" from the Manage Jenkins Page. 4. Select "Advanced" tabs from the Manage Plugins page. 5. Enter your Proxy Server Name or IP Address and Port number. Let's say our proxy server name is "proxy.learnitguide.net" and it works on port "8088". 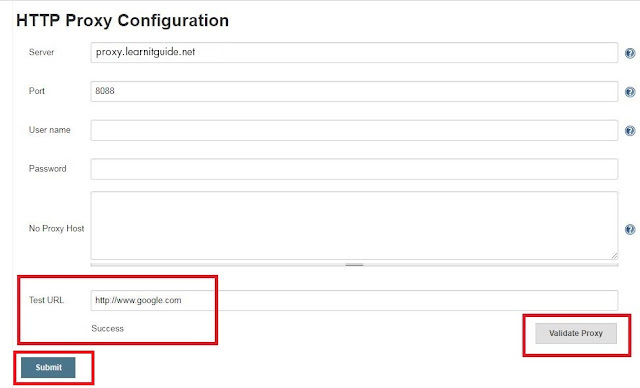 You must enter your proxy server name as "proxy.learnitguide.net" in Server field and proxy port number "8088" in Port field. Enter username and password only when you have credentials to use the proxy server, else ignore it. Before submit the changes, Use the "advanced" button and enter the test URL. Once URL is given, click "validate proxy" to ensure the proxy connection is working or not on Jenkins. If your proxy server accept your connection, it would give the output as "success". 6. Once your proxy settings are completed, click submit. Hope you have got an idea how to configure Jenkins proxy to install plugins. Going forward we will play more with Jenkins integration tool. Keep practicing and have fun. Leave your comments if any.